Michael Smuin makes the holiday season so very joyous as he presents �The Christmas Ballet.� A true holiday classic, this performance is a testament to the finesse and enthusiasm projected by each and every one of the talented dancers, as well as the entire artistic team. What helps make this production so entertaining is the tradition of having the scenes choreographed by such a variety of talented people. In my view, the 16 company dancers are at their best during the second half during such numbers as Elvis� �Blue Christmas,� and the lighthearted �All I Want for Christmas Is You.� Their comic timing is not only amusing but totally charming, thus leaving audience members with a huge grin on their faces. The Christmas Ballet continues touring the Bay Area with performances in Carmel at the Sunset Center (San Carlos Street, between 8th and 10th) on December 1-2, and Mountain View at the Mountain View Center for the Performing Arts (500 Castro Street) on December 6-10, and wrapping up with its annual holiday run at the Yerba Buena Center for the Arts (700 Howard Street) in San Francisco on December 14-24. For more than 24 years, Smuin has delighted audiences with its distinct American style of ballet, including its stunning physicality and expression. This season�s production is no different and is not to be missed. Tickets ($25-$89) are available by calling the individual venues -- Carmel: (831) 620-2048; Mountain View: (650) 903-6000; San Francisco: (415) 912-1899 or visiting www.smuinballet.org. 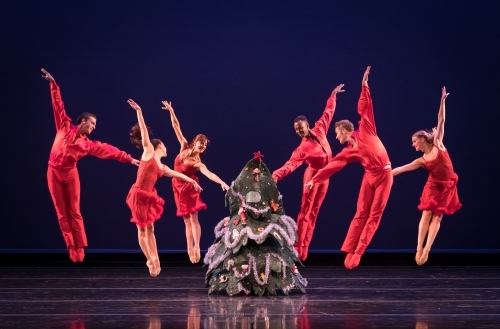 Photo caption: From L-R: Smuin dancers Robert Kretz, Terez Dean, Erica Chipp-Adams, Ben Needham-Wood, Dustin James, Oliver-Paul Adams, and Tessa Barbour in �Christmas Tree Rock� choreographed by Smuin dancer Rex Wheeler, part of Smuin's annual �The Christmas Ballet� touring the Bay Area now through December 24.